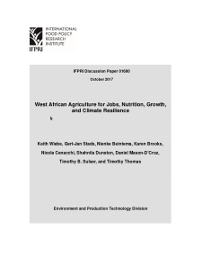 West African countries will need to build on and enhance the largely positive performance of agriculture in recent years to moderate or perhaps reverse projected higher prices and growth in imports. The effects of increased demand and climate change will be felt as early as 2030, and with greater force in 2050. Technologies are known at present and additional ones can be developed that will meet rising demand and perform well under projected changes in climate, but full preparation, release, and effective dissemination of the technologies will require investment and managerial engagement. Complementary investment in research, water management, and infrastructure will be more effective than separate and uncoordinated investments. Different portfolios of investment carry different costs, payoffs, and trade-offs among objectives. In light of the resource constraints and multiple objectives, rigorous analysis to reveal costs and trade-offs will assist in decision making. The composition of the agricultural research portfolio will affect the contribution of research to poverty reduction, nutrition, job creation, growth, and climate resilience. Research to raise productivity and yields of staples usually contributes most to poverty reduction. Research raising productivity of animal products, legumes, fruits and vegetables, and biofortified crops improves nutrition. Research raising the productivity and competitiveness of products requiring processing, whether for domestic, regional, or export markets, creates jobs. Research addressing the growing import gap contributes to growth and a manageable trade balance. Research on technologies for better management of natural resources addresses long-term sustainability. All of the research must take climate change into account. Important choices must be made in allocating resources among research programs. No single set of priorities is optimal, but analysis to clarify options and contributions to competing goals can be helpful in decision making.